Amsterdam, 1943 Hanneke spends her days procuring and delivering sought-after black-market goods to paying customers, her nights hiding the true nature of her work from her concerned parents, and every waking moment mourning her boyfriend, who was killed on the front line when the Germans invaded. ‘A gripping historical mystery’ Publishers Weekly, starred review. Although a star in her own country, [Tonke Dragt] is virtually unknown in the UK. But that’s slowly changing with last year’s English translation, the first ever, of her 1962 adventure story The Letter for the King (De Brief Voor de Koning) and, this month, the appearance of its sequel, The Secrets of the Wild Wood. The Letter for the King is a Dutch classic, winning the country’s children’s book of the year award in 1963 and, in 2004, the “Griffel der Griffels” for best children’s novel of the past 50 years. Translated into many languages, it has sold over a million copies worldwide. Tonke Dragt’s The Secrets of the Wild Wood, translated by Laura Watkinson, is published by Pushkin Press. via Tonke Dragt interview: ‘I was born a fairytale teller’ | Books | The Guardian. Annie M.G. Schmidt is a household name in the Netherlands. She died in 1995 at the age of 84. The jury of the Hans Christian Andersen Award, which she won in 1988, praised her for her ‘ironic tone, witty criticism and a style that is amusing, clear, rebellious and simple to its essence’. 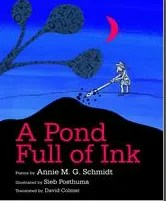 It’s fabulous to have a selection of her poetry available in English translation and the book has apt and lively colourful illustrations by Sieb Posthuma (see our previous review). My only wish is that the page designer had opted for a larger font size. via A Pond Full Of Ink.